WomansDay.com/Giveaways – Target Gift Card Giveaway. Do you love Target Store? How much would you like to win a gift certificat of $500 to make your purchase at a Target store or online at Target.com. 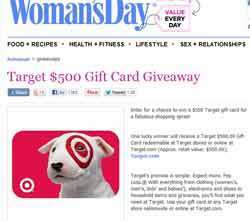 Interesting, well woman’s day popular magazine offers you the chance to win WomansDay.com/Giveaways with their “Target $500 Gift Card Giveaway”. Target stores offer a wide variety of products to suit your needs, from electronics to clothing and cosmetics you will be amazed by the quality of products offered. Woman’s Day Magazine covers many topics and issues related to women (womansday.com). Indeed, one lucky winner will receive a Target $500.00 Gift Card redeemable at Target stores or online at Target.com (ARV: $500.00) at Target.com. 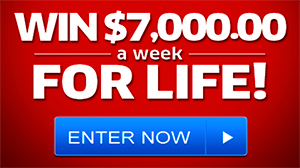 Visit today WomansDay.com/Giveaways Sweepstakes and follow the on-screen instructions to enter the promotion. Start on December 10, 2012 and ends on February 10, 2013. Entry frequency:Limit one entry per household per day for each sweepstakes for the Target Gift Card Sweepstakes. Multiple entries from the same household will be disqualified. a Target $500.00 Gift Card redeemable at Target stores or online at Target.com, ARV: $500.00.